What is a pop-up retail solution? Triumph’s PowerPad is an industry first, lock-up, 8’ x 20’ mobile space equipped with solar power, and battery storage. It is flexible, can be used as a temporary or permanent facility. Use it anywhere no need to be tied to the grid! The PowerPAD is secure, ready-to-operate, convenient, quick to deploy and can ship via road, rail, or sea. 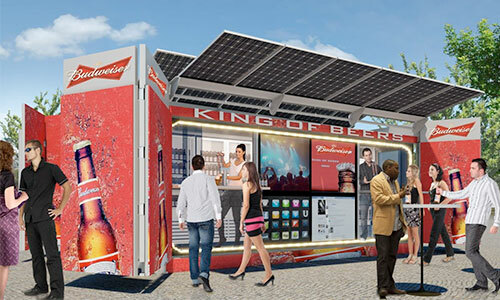 Where would you use a pop-up retail solution? The possibilities are limitless. Each PowerPAD unit is 20’ x 8’ and equipped with foldaway photovoltaic solar panels. Built-in battery packs store stable power for time periods without sunlight. PowerPAD can be customized to include solar arrays, wind turbines and more. Sufficient solar power is generated to drive laptops, lighting, refrigeration, air conditioning, TV, and signage. Interior spaces can be custom designed for different application needs and the outer shell closes up easily to encase and secure the inner core for safe shipping or overnight security.The revolutionary new Triumph powerPAD is an industry first, secure work space that functions independently from the power grid using its own source of solar power. It comes complete with off-grid wireless and satellite connectivity to the internet for accessing and relaying information. It is infinitely flexible, quick and easy to deploy for a wide variety of applications around the world.